Is it REALLY the end of August? I really had to keep reminding myself that it was August and that meant it was summer. Summer (what little we had of it) seems to have been over and done with for a while now. Last week was miserable and fairly cold so we only really visited the plot to harvest and we're still being bitten to death by antisocial insects. One thing that is really annoying is that it's rained lots of days in August and yet the ground is still bone dry. Most of the time it's either that 'mistly' stuff or pelting down so hard that it just runs off the hard soil! 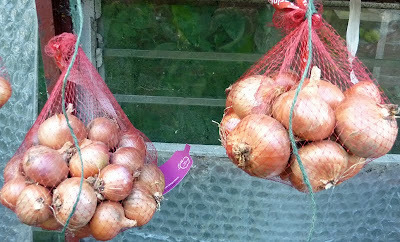 I’ve cleaned up one lot of shallots that were drying off on the greenhouse staging. All the loose dry skins have been removed and the shallots put into string bags – the sort that you get from the supermarket around the plastic trays that peaches and nectarines are packed in. I’ve also graded the bulbs as small, medium and large. We grew two varieties Pikant and Topper. Pikant has produced a much better harvest than Topper. Dahlias still aren’t exactly falling over themselves in their eagerness to produce cut flowers but at least they and the sweet peas are managing enough to provide some cut flowers. They haven't really got going at all yet this year and the weather forecast mentioned the dreaded 'F' word this week. FROST! At this rate some plants will have been frosted before they manage to produce even one flower. I've added a photo of the new colours that emerged last week. Other annual flowers planted amongst the fruit bushes are not only very popular with bees but also seem to encourage us to feel that summer hasn’t quite finished with us yet. Can't believe that I've just completed the entries for this year's August diary on my website here. I've also uploaded a video of how our plot looks at the moment. It's here if you are interested in viewing it. On the grapevine - or is it off the grapevine? We picked our first bunch of grapes of the season yesterday. I've kept tasting the odd grape but each time they weren't quite ripe until yesterday. For quite a few years now, the vine - Himrod - has produced masses of small, sweet, seedless grapes. There was a point when it took over completely and meant we could hardly grow anything else in our 10' x 20' greenhouse. 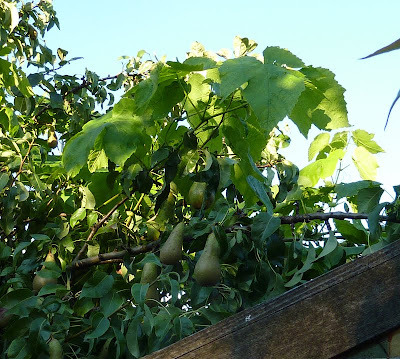 Now it is severely pruned each year but it is still managing to head out of a window and up into the branches of the pear tree planted next to the greenhouse. When we took over one of our plots we inherited two globe artichoke plants. We have never harvested the artichokes (it seems far too faffy to prepare and cook them) but we've left them in place for a couple of reasons. One is that they are really ornamental and the other is that the bees absolutely love the flowers. The flowers are often swarming with bumble bees but never quite as many bees as shown in this video clip. It's quite difficult to count how many bees exactly as they are swallowed up by the flower as they forage and keep appearing and disappearing. I think that these are honey bees but I am a bit puzzled as to why I can't spot any pollen baskets - surely honeybees would be stocking up to take pollen and nectar back to the hive. I'm happy now that they are honey bees especially as they also have been seen visiting our cardoon and this time were filling their pollen baskets. Spoke too soon didn't I? I hang up a pheromone lure in my plum tree in Spring. Seems to work well, the maggoty-plum ratio was only about 1 in 20 this year." "We haven't really suffered from maggoty plums"
Well I spoke too soon as tonight I found a small pink maggot in the centre of one of our plums. It was a lively little thing which is why the photo is a bit blurry. Thankfully I always cut them in half so at least I didn't find half a pink maggot in a plum! I guess this is the larva of the plum moth so it looks as though we will need to invest in plum moth lures as well as codling moth lures. Our plot will become very alluring! Goodness knows what else we will have to lure away from our fruit - I suppose the next thing will be raspberry beetle! Gardening Naturally have a page that is devoted to entrapment so I guess the plum moth trap is what I need now! 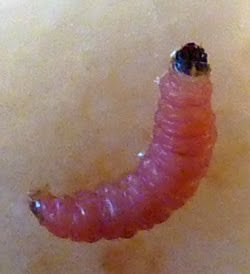 I have only found one pink maggot so far so is it too early to panic? If Matron is around is that what you have used? The Victoria plum has been a pleasant surprise. We thought that we were going to be plumless this year. Our largest tree – the yellow Oullins gage – produced a huge harvest of fruit last year but this year has only a few fruits carried on the topmost branches. Unfortunately the wasps got to them before we did. The smaller Victoria plum has been quietly producing plenty of fruit hidden amongst the leaves. Turning from green to plum colour the fruits have become more noticeable and although many of the fruits had succumbed to brown rot there are plenty of ripening plums which we are picking as soon as they are ready – the wasps are not going to have all of these! We also picked a couple of Mannings greengages – which were absolutely delicious – the gage trees too have only a handful of fruit and being green the fruits tend to be camouflaged. Unlike the Victoria plums the ripe fruits are no easier to spot. No photo as we ate them before thinking about taking one! The dahlias have at last produced enough flowers for a vase - the ones in the photo are the ones on flower - there are others to come and one yellow one had gone a bit brown in the rain so I didn't take it's photo. No idea what varieties they are maybe I once knew and have forgotten as the tubers are quite old now! Our fourth variety of carrot hasn't let us down. We dug some just to see what they were like as really it's a bit early for this variety - Autumn King. On a more itchy note - is anyone else getting bitten to death every time they go outside My body is like the beach on a busy summer's weekend. Last week's diary entry is now posted on the website here and a photo album for last week is here. 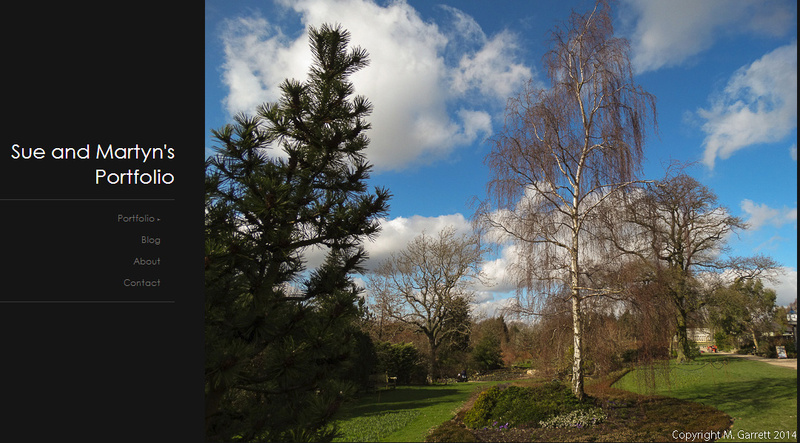 For last week's weather diary with more photos visit Martyn's blog here. Last week this included a video clips of our visit to Newmillerdam. (By the way the panting in the background isn't me!) and the canal lock near Fairburn Ings. All in all a busy week!! How's this for a tomato or maybe it's several? 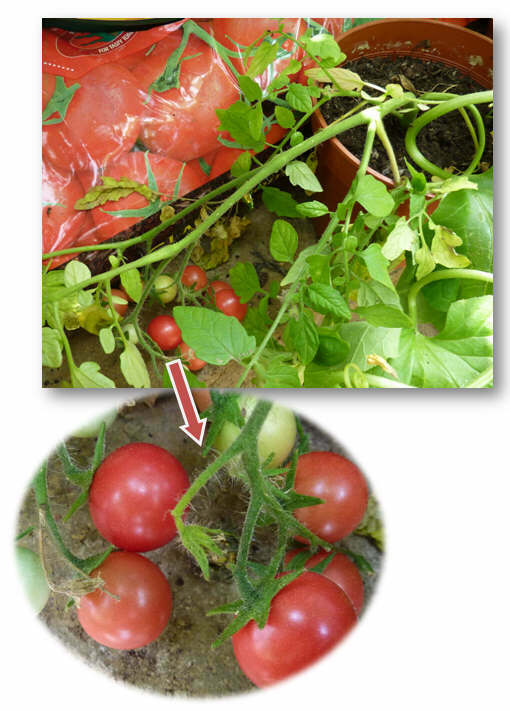 This strange tomato is growing on one of the costoluto fiorentino plants in our garden greenhouse. This was grown from a packet of free seeds that must have come with a magazine. 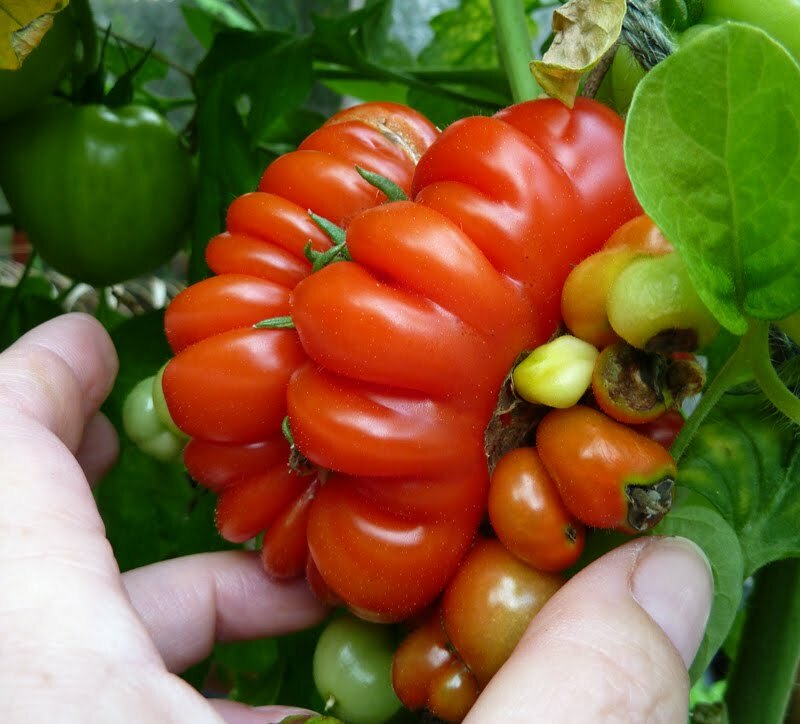 It's supposed to be a beefsteak tomato and all the other fruits look like you would expect a beefsteak tomato to look. All the bits in the photo (except my fingers) even the green bits are conjoined. Wonder what it will be like when we cut into it? I think I'll add it to my collection of strange fruit and vegetables on my website here. Disappeared into the ether of cyberspace! My old website has now been disconnected and a redirect has been set up to my new (well not so new now) website. I happened to notice that some images were missing on the new site. 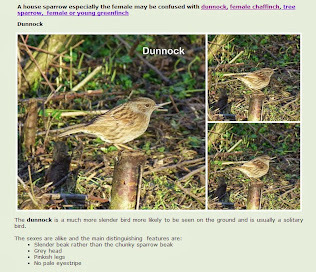 I had copied and pasted the information and must have forgotten to upload the photographs to the new site. Whilst the old site was still active it didn't matter as the page just picked up the images from there but once this site disappeared into the ether - well so did the images. If you visited any of these pages recently and thought something was missing - apologies!!! Also if you spot any pages on my website with broken links or missing images will you let me know - also there will be links from my blog archive to the old website so again if you find any will you help by letting me know then I can change them! There's a hole in my apple! As if we weren't having enough trouble with our apples - now we have a squatter! It's sisters have also homed in on the few fruits on our yellow plum tree. (Yellow plums not yellow tree). The only plums on this tree are really high up and after much effort (Martyn's effort) trying to get them, we found these little devils had got there first. Hope they leave us some apples and plums on our other plum trees. At last - the long wait is over! At last we have our first ripe tomatoes!! The yellow one is ripe - it's meant to be yellow! We are growing quite a lot of different varieties from cherry to beefsteak. The cherries were the first to ripen. We also harvested our first sweet corn cob. The first one is always a bit of a test to see if it is fully ripe - and it was - lovely and sweet. Being grown on the allotment we can't really get it straight from the plant to the pan but near enough. Maybe we need to take our camping stove to the site one day for the plant to pot experience and see whether it makes such a difference. 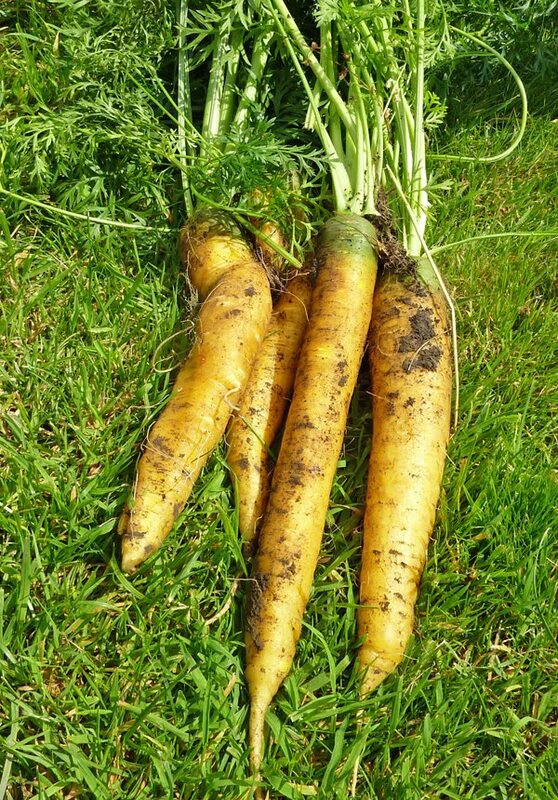 We dug up the first of our third variety of carrot - this time Yellowstone. More good carrots. Just a bit of green on the shoulders of this batch where the carrot tops had pushed up into the light but nothing a bit of a trim won't cure. (Sorry to those of you struggling with carrots). Runner beans are now being added to our French bean harvest. Shallots are drying off in the garden greenhouse . 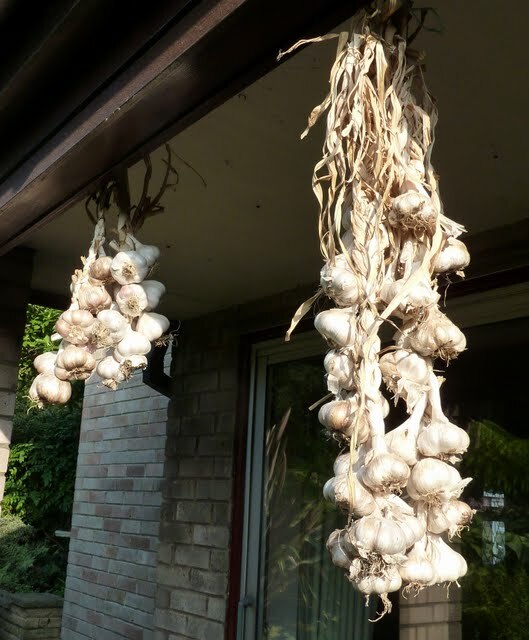 All the garlic has been plaited - the shorter strands are so we can walk under the porch without being hit on the head - well really at 5'2" I wasn't having any trouble but Martyn was! And finally the dahlias have started to flower!!! I may even have a vase full for the weekend. Sprouting Broccoli Late White - Tender white shoots from mid-March. Sprouting Broccoli Claret - Large purple spears from early April. Cabbage F1 Sparkel - Quick to crop and produces lots of tasty, nutritious leaves. Cabbage Spring Hero - Solid heads from early May. Cauliflower Mayfair - High quality curds in April. Kale F1 Reflex - A heavy-cropping variety. Pick off the tasty, dark green leaves as required. SAVE £4.95 on pack of 72 plants! 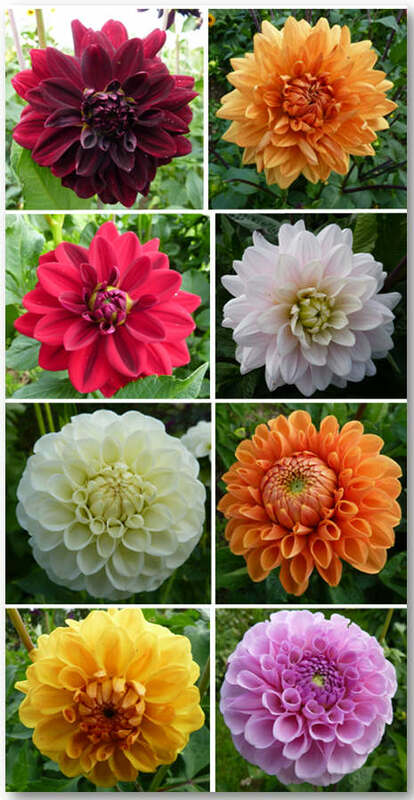 The Dobies offer has also changed as now you can only order 72 plants for £14.95 same as the Suttons 72 plant option. Double the number of plants so if you fancy the offer then you would probably need to team up with a friend! Anyway I can't keep tabs on these offers so if you click and get page unavailable then I guess that you are too late!!! 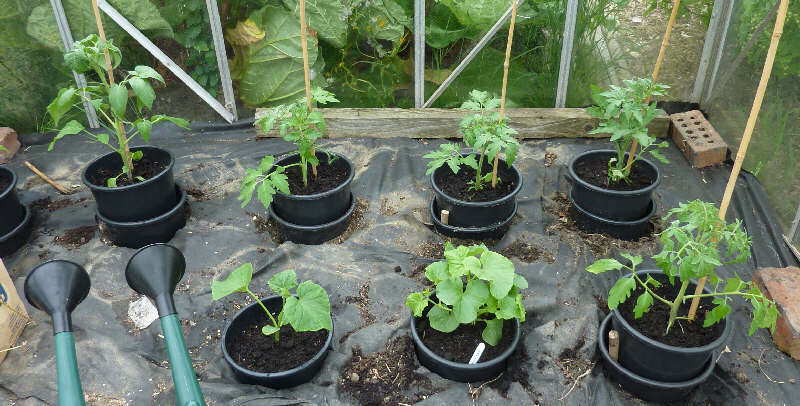 36 Plug Plants, 4 seed packets + 1kg Carlingford Potatoes FREE! We've ordered exactly the same plug plants (variety and number) without the potatoes and seeds for £9.95. For us it's a better option. But would you believe that since posting this information this morning that the Dobies offer has changed to this one 72 plug plants for £14.95 Double the number of plants so if you fancy the offer then you would probably need to team up with a friend! Not everything on the plot is rosy (red)! Just to provide a bit of balance to those of you who are bemoaning poor carrots, I'd just like to point out that not everything we grow is as successful as our carrots. 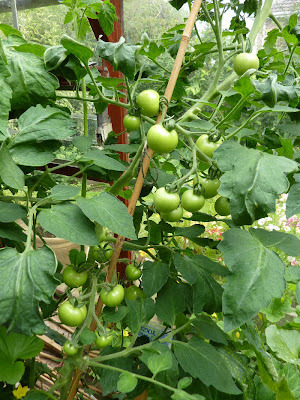 Lots of blogs that I visit are displaying bumper harvests of tomatoes. So far we have only had as many tomatoes as you can count on the fingers of your hand - and I mean one hand! The tomatoes in our plot greenhouse have been an unmitigating disaster! The plants were fine when they went in exactly the same quality of plants as went in our garden greenhouse. We planted them in bottomless large pots into holes the greenhouse border - also filled with compost. Healthy plants with lots of tomatoes the only problem being that they are still GREEN although I must admit a few are beginning to realise that RED is the desired colour. 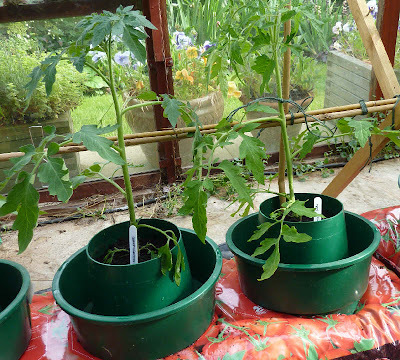 It was a cherry tomato plant that was surplus to requirements and had been left in a 4" pot on the greenhouse floor. Any watering it had was accidental when watering other plants and more often that not the plant pot had tipped over on its side! Despite this it managed to produce these perfect little tomatoes. Nature's will to survive is incredible unless that is the plant is in our plot greenhouse! To rub salt in the variety is Garden Pearl which came free with one of our magazines! To end on a positive note we dug some of another variety of carrots today - this time Early Nantes 2 and they too look good. But man (or woman for that matter) cannot live on carrots alone! Some ripe tomatoes would be good! If you are interested in our weekly diary then click here for last week's entry on our website. Judgement day for our carrots! We have had carrots earlier in the season but these were sown in a trough of compost and started off in a cold greenhouse. 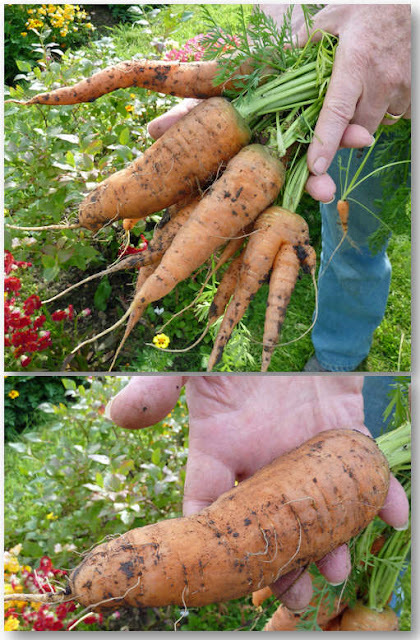 This weekend we decided to see what our outdoor sown carrots had produced. We were pleased with this first digging! We sowed four different varieties of carrot - Autumn King 2, Early Nantes 2, Yellowstone and Flakkee. 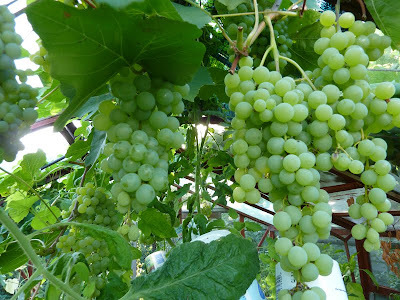 We have grown the first three varieties before so we decided to try Flakkee. 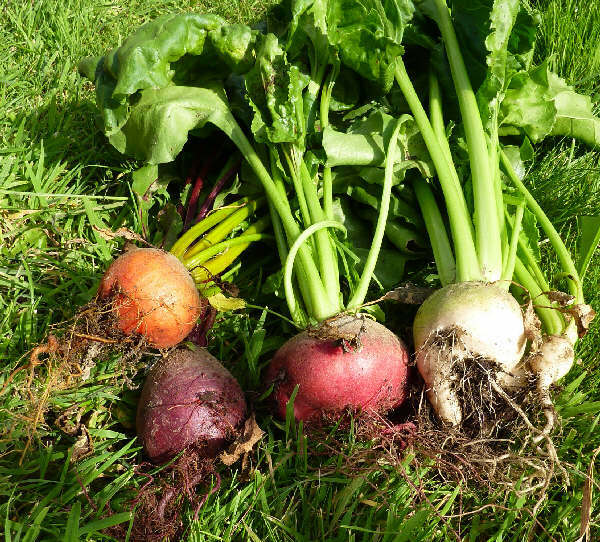 The catalogue description said this was an easy to grow, main crop variety, producing large, thick roots, having very good colour and flavour. We had some for dinner and certainly were not disappointed. As you can see from the one being held it certainly has produced thick roots too despite the fact that we don't thin out our carrot seedlings. So all in all the catalogue description was fair. 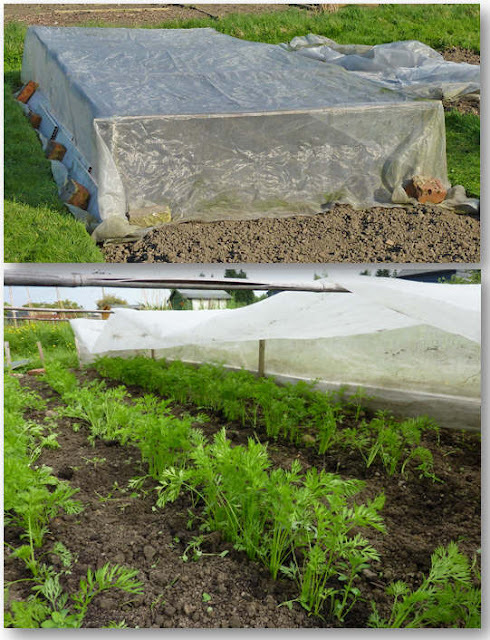 Our soil is heavy clay which can make carrot growing challenging but in spite of being warned when we first took a plot that, "You'll not grow carrots on this site!" we have had good success using a method that works for us. Click here if you're interested in more detail of how we grow our carrots. We grow carrots under enviromesh to protect from carrot fly and in the past have had to remove this to weed but this year we only weeded once when the carrots were quite tiny. 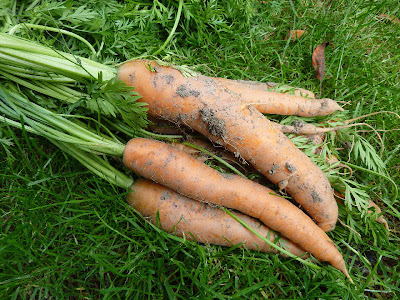 We read in one of our gardening magazines that once carrots got growing they could hold their own with any weed growth. Anything to cut down on weeding sounded like a good idea and the covering of enviromesh means that weeds are out of sight and out of mind so we just let the carrots get on with it after this initial weeding and it seems to have worked. Our carrots will stay in the ground until they're needed. We find that if we dig them to store they seem not to keep as well as if they are left in the ground and covered with straw. Click here to see how we store them over winter. If all the other carrots are as good as these they should keep us well provided for over winter. Do you need airborne biological control - just call in the flying squad! The video below shows just why we encourage birds onto our plot and into the garden. The twittering in our plum trees drew attention to a flock of goldfinches. They were busy at work picking aphids off the back of the leaves. The bird in the video is only a baby but already capable of doing a pretty thorough job! Birds often get a bad press from gardeners when they dig up seeds, peck at fruit, strip down cabbages etc. and some people can't understand why we encouarge them but in my opinion the benefits outweigh everything else. 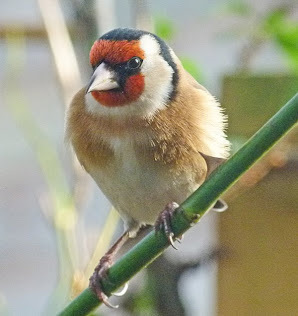 On our website there is an article about goldfinches including a video clip of a beautiful adult bird on one of our garden bird feeders. It's here if you want to take a look. In a pickle or just cooking in the rain! Martyn wanted to make some picallili so that he could use up some of our courgettes. The only problem was that the process of boiling vinegar takes the breath away, brings tears to the eyes and also makes the whole house reek. After making the first batch a couple of years ago we decided never again but then we tasted the picallili and it was just so good! 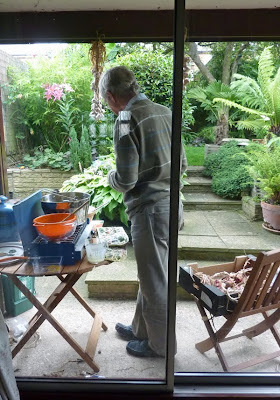 Last year we, (royal we that is), did the cooking in the garage but this was just another enclosed space so other than sparing the house of vinegar fumes it wasn't really a solution. This year the idea was to cook outside on the patio. This morning looked as though it was going to keep fine and so the outdoor cooking area was set up and cooking began. Then half way through it started to rain quite heavily. Fortunately the outdoor kitchen was under a covered area and so the piccallili wasn't watered down by the rainwater. It doesn't look as though it is raining in the photo but honestly it was! The only problem was to do with timing. The cooker clock had been set to the required cooking time. Rain meant that the kitchen door needed to be kept shut but being stuck outside Martyn wouldn't be able to hear the pinger when the time was up. So a system of hand signals from me inside to him outdoors was needed. 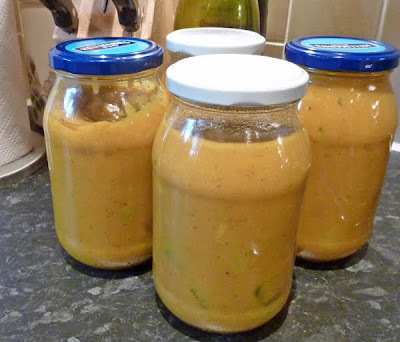 End result was four jars of piccallili that should now stand for a while before being eaten - anyway we had some with our salad tonight and it was already delicious so why wait? Who knows we (royal we again) may even have another outdoor cooking session another day! The jars still need labelling - that is as long as we haven't eaten it all first. 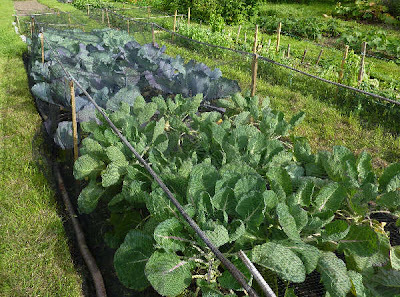 The recipe used was one given to us by Pat our plot neighbour and is available on my website here. In the unlikely event that you haven't any courgettes, cucumber can be used instead. We have also had a variation where runner beans were pickled in the sauce mixture which is also good. To peek inside the pan then click here to visit Martyn's weather blog. We gave ourselves some time off gardening this week and spent one day visiting Helmsley Walled Garden in North Yorkshire. We were really impressed by the garden especially the kitchen garden areas. I’ve shared some of the photos taken and a video on my web site here but below is a taster. Potatoes harvesting has now begun in earnest as tops are dying back. 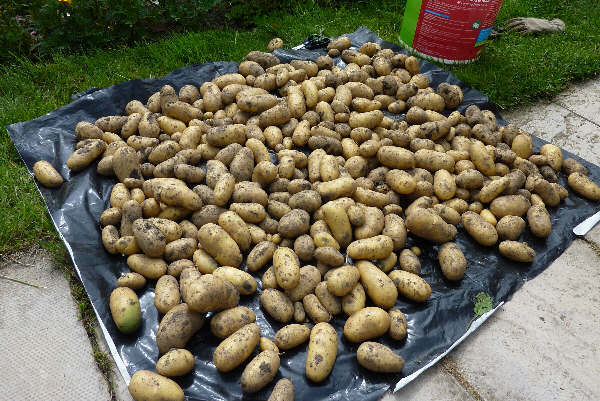 After the dry weather in May and June our hope of a bumper crops were not very high but so far the potatoes are delivering a decent crop and the tubers are relatively clean and slug free. We have grown several varieties and some are still to be harvested but we have especially enjoyed the International Kidney. Today we harvested our first beetroot. We've grown four varieties which give an interesting range of colours - even the stems and leaves are different - one Chioggia only shows its true colours when sliced as it is supposed to have white and red rings - we will see! If you are interested my full diary entry for the last week in July - can't believe that it's already August - can be read here. The weather summary for July is here. Please leave our apples alone! I know it is unlikely that the person/people who has/have been pulling apples from trees on our allotment site is/are reading this but just in case my message to them is "Please leave our apples on the tree. If you are so desparate to taste them then ask and I'll pick you an apple when it is ripe". To explain why I am so cross - this weekend on visiting our plot we found lots of apples on the ground which we would have assumed had fallen prematurely had they not been bitten by human teeth! Also the apples appeared to have been thrown away from the trees. Other plot holders have also had the same problem so we seem to have someone up to no good. 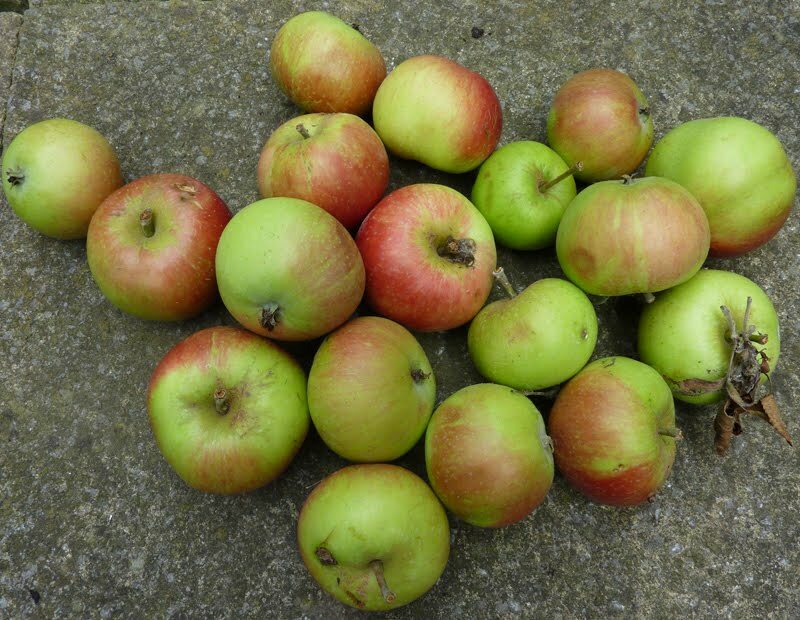 No doubt having taken apples from the tree and found that they were unripe it was good fun to take off more and throw them about. The allotment telegraph has suggested who the culprits are but this is a case of someone who told someone he had seen someone etc. so not really strong enough to point a finger - just hope that it doesn't happen again! I don't think people realise that someone has spent money buying the plants on their plots and also spent time and effort looking after them. Or maybe they just don't care! We bought a lure to trap male codling moths and I have been busily trying to eradicate woolly aphid but this is one pest that is more difficult to control! Although they are risking that no-one has sprayed their apples recently aren't they? By the way is anyone else getting a service unavailable when trying to leave a comment on Blogger blogs. When I refresh the page then the error goes away! Strange.